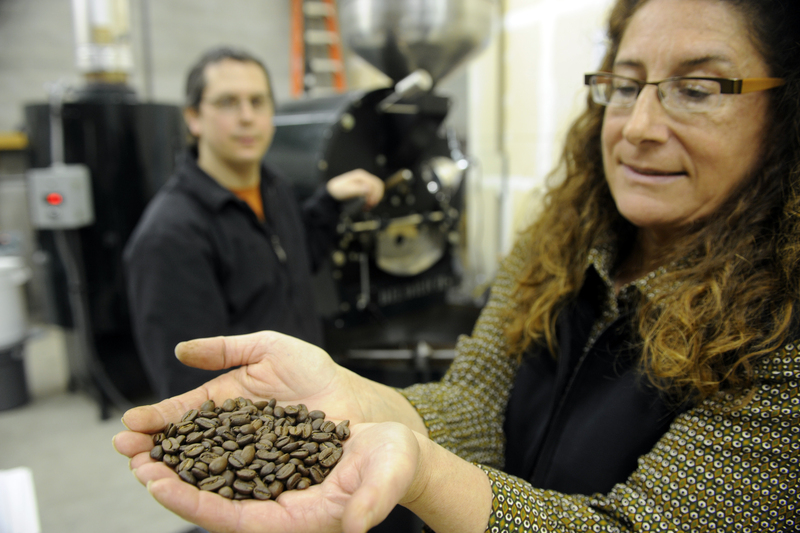 Roast House Coffee owner Deborah Di Bernardo and roast master Dave Rier will be pouring samples of four or five different coffees 10 a.m. to 4 p.m. Saturday at Main Market Co-op. The samples will include a taste of the coffee Di Bernardo and Rier roast for Main Market’s private label, Misael’s Columbian, which is exclusive to the co-op. Roast House hosts a coffee tasting (cupping) every Thursday at 1 p.m. that is open to the public. They also post information about special coffee tasting events on Facebook and Twitter and include the roasting schedule so customers can stop in and watch. Roast House Coffee is located at 423 E. Cleveland Ave., Suite C. Reach the business at (509) 995-6500. There’s little elegance in the practice of cupping coffees. When professional tasters are checking the aromas and tastes of coffee, they start with several samples of the grounds. Once brewed, tasters sniff and then loudly slurp a bit of each sample. The slurping, says Roast House Coffee brew master Dave Rier, aerates the coffee and sends it to the back of one’s mouth. It allows the taster to evaluate each sample for its aroma, taste and mouth feel. At Roast House Coffee, Spokane’s newest boutique coffee roastery, cupping is something they do each day to check the coffees they’re roasting. Owner Deborah Di Bernardo invites customers and anyone curious enough to try it to drop in for a tasting. That means knowing many of the coffee bean growers and their growing practices. It means paying higher than fair-trade prices for the best coffee beans they can find. And it includes doing their part to help their growers get the best prices they can for their coffees. In other words, they want to be as socially responsible with their practices as possible. “If I can go someplace and encourage people to make a higher-quality product so they can make more money from it, I think that’s great,” says Rier. Known as the “third wave” of the specialty coffee movement, Roast House is part of an informal group of businesses, including growers, roasters and sellers, who want to foster culinary appreciation for coffees, their unique flavors and origins. Roasters take care with the beans to preserve the flavor profiles that make them unusual by roasting the coffees less in some cases. They give all of the information to their customers, who often share those values and are willing to pay more for the coffees. “We make it our business to know the country of origin, the name of the farming co-op, the roast profile and other unique attributes of each type of coffee we provide,” Roast House owners say on the Web site, www.roasthouse.net. The values are similar to a Slow Food approach, says Di Bernardo, who serves on the local Slow Food chapter board. Both Di Bernardo and Rier worked for Thomas Hammer Coffee Roasters in Spokane, before leaving to open the small roastery in January. Di Bernardo found a like-new coffee roaster at a Spokane coffee business that failed and relocated it to the small warehouse space on Cleveland Avenue in North Spokane. “We just had our own ideas of what we wanted to do,” Di Bernardo says. Rier is the green-coffee buyer and roasts the beans in small batches. Roast House specializes in providing private label coffees for other businesses. Right now, they’re roasting a small lot of coffee they call Misael’s Columbian for Main Market Co-op. It is named for the coffee grower who provided the beans. Other private label customers include Atticus Coffee in downtown Spokane, a new Mexican grocery store, El Mercado del Pueblo, on North Division and late this week, Cassano’s will begin selling coffees from Roast House. Huckleberry’s on Monroe and the Huckleberry’s inside Rosauers stores at University City in Spokane Valley and at the North Division “Y” also carry Roast House coffees that are sold under the Roast House label. Although cupping coffees is a professional tool that can help roasters and buyers evaluate coffees and find flaws, it’s still fun for amateurs. The business invites customers to come to an open tasting each Thursday at 1 p.m. and to other special cupping events. Those who attend will sniff and slurp along with Rier and Di Bernardo, who lead a discussion of the differences in origin, flavor profiles and roasting methods. They help tasters pick out smoky, sweetness, citrus, tobacco, floral and earthy notes as they share coffees they’ve roasted from around the world. They offer an unusual tasting where guests compare the flavor profiles of the coffees they’ve tasted with the taste of microbrews. Rier and Di Bernardo discovered the similarities in flavors this winter when they were brainstorming and planning to open the business. Rier was kicked back with a beer when the flavors reminded him of something he’d tasting during a cupping. Di Bernardo and Rier say they don’t expect to make a ton of money, but they do hope their commitment to preserving the unique coffee flavors and their efforts to find direct relationships for buying coffees will bring changes to the industry.